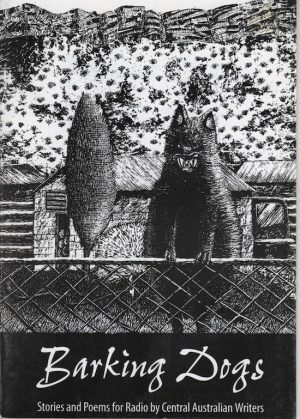 Barking Dogs – the broadcasts, this book and the cassette tape – represents the continuation of an initial project, Bush Letters, devised in 1993 by Gabrielle Dalton to develop a literature network among Northern Territory writers. Sally Jeavons, through her involvement with the Alice Springs radio station 8CCC, took up the story and announced the Writers for Radio Project with the aim of promoting Central Australian writing via radio broadcasting. Contributions of pieces of up to one thousand words with a Centralian theme were invited. From the many writers who submitted work, nine poets and nine prose writers were selected, representing an array of styles, themes and genres. Most contributors attended a co-editing workshop led by editor-in-residence Janet Blagg in which specific demands of radio writing were addressed by writers working together – and thus another element in networking and co-operation were realised.